Whether you agree with this post depends on whether you accept the premise that the EU is a profoundly anti-democratic organisation. I have made that case on this blog so I will not repeat it here. Arron Banks has been referred to the National Crime Agency in respect of his alleged dodgy financial dealings. I don't care. I have never met the man, and exchanged few words, most of them derogatory. My decision to vote to leave the EU is based on a long standing democratic principle and I was never going to vote any other way. This evening I tweeted "I think I speak for virtually all leavers when I say Tony Blair and John Major did a million times more to influence my #Brexit vote than Arron Banks or Vote Leave". It has some 2600 likes so I think I am in the right ballpark here. Most had never heard of Arron Banks until the referendum. I certainly hadn't and my perceptions of the EU have been forged over two decades. As a sentient adult I voted to leave of my own volition, I was not brainwashed by any Facebook adverts of clever marketing techniques and I use ad blockers or browse from my phone where most adverts I scroll past or don't see at all. I am of the view that most of the money spend on digital adverts was wasted. They spent the money on that simply because they didn't know what else to do with it. But even supposing I am the odd man out and my fellow leavers are putty in the hands of digital hypnotists, I still don't care a jot. I don't even care where Banks got his money to finance his operation not least because it would have been better had he not bothered at all. I did not view his input as constructive or useful. In the end, though I favour a moderate mode of exit I am still a Brexit fundamentalist and I am none too concerned about the tactics deployed to leave the EU because I view the EU as an illegitimate authority given power by betrayers who gave away powers that were not theirs to give. If underhanded tactics have to be deployed then so be it because the enemy can will and has done likewise. From the outset the leave movement was up against the entirety of the establishment be it academic, industry bosses, the legal profession, the state broadcaster and the Westminster machine - all of whom have been plied with junkets, goodies and treasure over a number of decades to buy their loyalty to the EU. It has made many sectors of civil society hopelessly dependent on it and if we are talking about foreign interference in UK democracy then the EU of itself is a culprit and we don't hear similar wailing about one George Soros who has almost single handedly bankrolled the legacy remain campaign. Put simply, we are here to save democracy, not practice it. We Brexiteers believe that the nation state is the only construct capable of delivering meaningful democracy and societal harmony and that the EU by design is an attack on that. I do not, therefore, accept that we should be restrained in fighting this beast which neither plays by the rules nor does it play fair. We are also in the grip of an establishment which repeatedly lies to us about our relationship with the EU. We were told there would be a referendum on Lisbon. There was not. We were told Cameron had used the veto. He did not. We were told that we could stay in a "reformed EU". There was no reform. We are told we should stay in and reform it - when they have no intention of even proposing reform and we wouldn't get it if we did. They lie through their teeth and they have done so for generations. The history of Britain's relationship with the EU is one lie after another. Party leaders are eurosceptic in opposition but committed federalists when in power. the only way we were ever able to get a say on the matter was to organise and threaten the establishment balance in Westminster and even then, every trick in the book was deployed to avoid a referendum. Now that we've had it, they have deployed every means at their disposal to frustrate and delay it. We who believe in democracy and the nation state are up against liars and cheats. Should Arron Banks be found guilt of anything it still does not change the fact that 17m of my fellow countrymen went into the voting booth and of their own volition voted to leave. Of itself that is legitimate but if we are talking about which camp spent the most, then we have to take the entirety of spending into account and that includes EU social fund spending in the regions on ploys designed to buy the loyalties of the public with our own money. I could also make mention of the £9m government leaflet or the way in which the UK government used the international sphere to lecture us, inviting bosses of the WTO past and present to wag the finger at us. The Obama intervention. And you want to talk to me about foreign meddling? 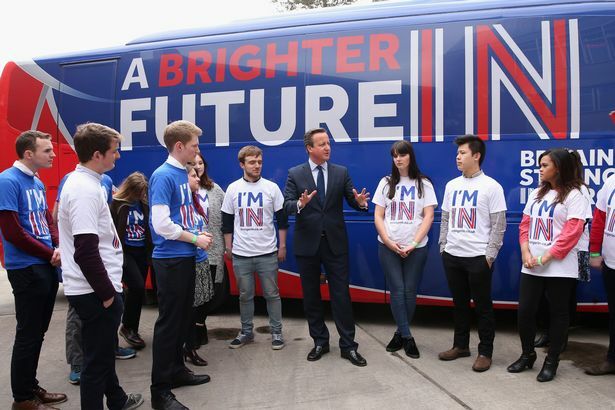 Not forgetting that the Remain campaign outspent Leave by a margin of £19,070,566 to £13,436,241. This was a campaign to belittle, demoralise, and chastise the public, one in which they enlisted celebrities to patronise us and pop stars to emote at us. At one point we were held collectively responsible for the murder of an MP by a neo-nazi lunatic. They do not think we should have demcroacy because we cannot be trusted. They do not like us and they hate the idea of us having a say. I went into this campaigning for an EEA Brexit which would have given leavers much of what they wanted while preserving much of what remain claim to value about the EU. They dishonestly conflated the EU with the single market and instead of accepting the result and working toward a viable compromise they used millions in foreign funding to mount a legacy remain campaign to keep us in, not out of genuine love for the EU but out of pure spite because they lost. In doing so they made this a culture war where one side has to lose. If they have found Brexiters uncompromising it is because after decades of betrayal and deceit there is no trust left and we wouldn't put it past our rulers to stitch up a Brexit deal that sees us still under EU direct control with a view to taking us back in later. It is europhiles who have sown that mistrust over decades. Now you reap. As much as Brexit is about ending the rule of Brussels it is as much a yank ion the leash of our politicians to remind them who is boss. We have corrected their mistake. They now warn us that if there is no deal then we see a cascade of failure and the termination of all of our foreign relations. This is because they and they alone put all of our external relations and regulatory constructs into a single treaty framework and handed over the keys to Brussels. They are the ones who created that vulnerability in the belief that it would be irreversible just so long as they continued to deny us a say. 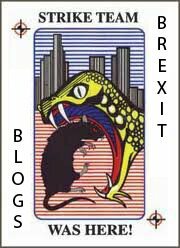 Brexit is the culmination of their hubris, deceit and and supercilious paternalism. If there is a high price to pay that is as much to do with their own ignorance of how the EU works and precisely how much control we have given away. They rubber stamped the treaties of the EU without even reading them. It is this class of indolent wastrels we are at war with and we will take back what is ours by any means necessary. Additional: Unlike Remain's "independent" campaigners, this blogger does not have any foreign billionaires propping him up. Please give if you can.